The city's new motto, "Munich Loves You," may be a bit commercial, but it is exactly how you will feel from the very moment you find your bags at the airport. It is also not overeagerly presumptuous to say that whoever you are, this Bavarian capital will have you head-over-heels enamored with some or all parts of its eclectic mish-mosh of cultures. There is absolutely something for everyone when you travel to Munich. Of Germany's major cities, Munich is Berlin's more cosmopolitan sister, with perhaps a bit of an adolescent identity crisis. Throughout history Munich has often taken a different path from the general German way. During the Reformation, Munich remained staunchly committed to the Catholic Church, and while the people enjoyed the flourishing Renaissance period, the Duke marveled in such endeavors as bankrupting those very institutions. 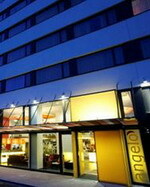 The Angelo Designhotel Muenchen is a design hotel located in Munich, Germany, in the trendy district of Haidhausen, 100 metres from Leuchtenbergring train station. Marienplatz central square is four kilometres away, and the extensive urban public park, the English Garden, is five kilometres from the hotel. This contemporary design hotel has a slate-tiled lobby, and is furnished with asymmetrical leather armchairs in black, burned orange, and burgundy tones. Multilingual staff at the 24-hour front desk can provide information on tourist attractions and arrange transport, and the hotel operates a limo/town car service. Complimentary wireless Internet access is also available in public areas, and angelo Designhotel Muenchen is a smoke free property. Angelo Designhotel Muenchen provides a healthy complimentary buffet breakfast of fruit and vegetables in its primary- coloured Sunlight restaurant. The lobby bar, which is decorated with oriental-style lampshades and a collage of contemporary black and white photographs, serves a selection of wines, cocktails and light snacks. The modern, six-floor Flemings Hotel Munich Schwabing is in the upbeat Schwabing district of Munich, Germany, 500 metres from Dietlindenstrasse station. Marienplatz central square, the Museum of Modern Art, the Olympic Stadium and Park, and the BMW Museum and Tower are within five kilometres of the hotel. Decorated in olive green and black, the Flemings Hotel's minimalist-style lobby welcomes guests with coffee and complimentary newspapers. There is a 24-hour front desk with multilingual staff and concierge services. Flemings Brasserie and Wine Bar serves Mediterranean specialities and fine wines on the terrace. 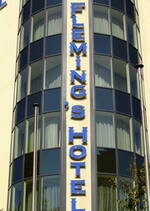 Flemings Hotel provides six conference rooms with banquet facilities. Complimentary Internet access is available in public areas. The hotel has a gym and spa with sauna, steam room and massages available. 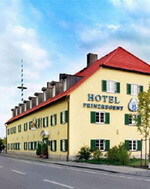 The Prinzregent an der Messe is a hotel in the traditional, Bavarian style, situated 800 metres from the New Munich Trade Fair Centre and ten kilometres from the centre of Munich. This hotel offers 91 guestrooms over four floors, all of which have country house-style decor with Italian antique-style cherry wood furnishings. Guests can relax in the sauna and steam room, or pamper themselves with a massage, all within the ornately-decorated wellness centre. Guests can also enjoy a drink in the bar, dine on Bavarian cuisine in the restaurant with rustic wooden furnishings and al fresco terrace and take in the atmosphere of the traditional Munich beer garden, shaded by verdant chestnut trees. The contemporary InterCityHotel Muenchen in central Munich, Germany, is 50 metres from Munich's Hauptbahnhof main train station and one-and-a- half kilometres from Marienplatz square. Popular attractions including the English Garden, Olympic Stadium and Park, and the BMW Museum and Tower are within five kilometres of the hotel. The high-ceilinged lobby has arched windows, deep red carpets, leather sofas and newspapers for guests to read. The 24-hour front desk provides concierge services, and InterCityHotel Muenchen guests receive a pass for free travel on public transport. Decorated in vibrant reds and blues, Fleming's Brasserie and Wine Bar serves international and Mediterranean dishes with an emphasis on seasonal ingredients. Its bar has an extensive wine list. 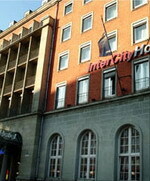 The InterCityHotel Muenchen houses a business centre and eight conference rooms. A charming hotel, designed and decorated with exceptional taste. The harmoniously styled decor with its warm colors is complimented by outstanding all-round service, turning every stay into a genuine delight: the perfect place for guests who value comfort combined with class. Easily reached by car, the hotel is also well connected to the public transport system, with rail and subway stations just across the road. You can reach the main station and the city centre in a matter of minutes, while nearby you’ll find the famous Oktoberfest grounds, numerous restaurants, beer gardens and plenty of places to shop. Start the new day inspired by our stylish, harmonious surroundings, which positively invite you to enjoy the buffet – laden with enticing, lovingly prepared delicacies – in peace and tranquility. Choose from a wide variety of high-quality dishes, including many regional specialities. Throughout the morning, between 6.30am and 11.00am, our attentive, friendly staff will attend to your every need, pampering you with tea, coffee and local specialties – or, if you prefer, a glass of sparkling wine. 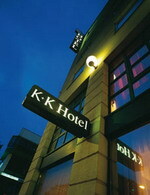 The Kings Hotel First Class is located in the centre of Munich, Germany, less than a kilometre from the Old Town. 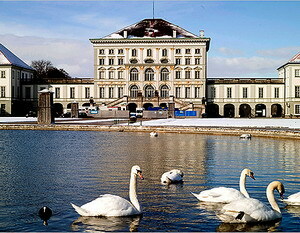 The city's main train station is 200 metres from the hotel. Set in a white-fronted Victorian-style building, the Kings Hotel First Class has a wood-panelled lobby with original artwork. 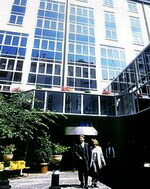 There is a traditional shoe-shine service, and concierge staff can provide information on Munich attractions. The hotel can arrange shuttle buses to and from the airport and exhibition centre (surcharge). The Bavarian-style Weinstube restaurant serves light meals, snacks and drinks throughout the day. A buffet American breakfast is served in the traditional wood-panelled dining room. The hotel has a relaxation room featuring a Finnish sauna, steam room and a heated stone bench. Beauty treatments and massage services are on offer. 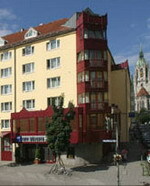 Maritim Hotel Munich is positioned near the central U-Bahn Station that connects the property directly with the Munich Trade Fair. 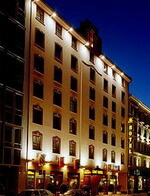 The hotel is located off busy Goethestrasse near the Theresienwiese, where Oktoberfest takes place. The Bistro serves international favorites with regional influences. International buffet-style breakfasts are served at the Rotisserie. Summertime heralds the opening of the hotel's Beer Garden. Draft beer, the Bistro's menu, and mingling with locals are highlights. A business centre includes a computer, printer, and wireless Internet access. Nine function rooms accommodate up to 550 people, and a ballroom glitters with modern chandeliers. A stairwell leads to an indoor pool, sauna, and steam room. A small sun terrace offers panoramic views over famous structures such as the Frauenkirche. The hotel's Piano Bar provides live piano music every evening. This popular spot among locals and international travelers offers a range of malt beers. In the heart of the city of Munich, close to the Stachus shopping district, next to the site of the world famous "Oktoberfest", and walking distance from the most famous beer houses in Munich and the "Deutsches Theater" theater. Stay overnight in comfort at reasonable prices and take advantage of all the facilities offered by the TRYP Hotels. The hotel is well communicated; only 100 m distance from the subway station "Theresienwiese" - a 40 minute train ride to the airport - and the Railway Station. The hotel also offers a private garage.